This Place, an exhibit in the Tang Museum until late April, is a multi- year project that invited a group of international artists to explore Israel and the West Bank. It focuses on different perspectives of one of the most contested regions through the eyes and lenses of multiple artists, including Frederic Brenner, Wendy Ewald, Martin Kollar, Josef Koudelka, Jungjin Lee, Gilles Peress, Fazal Sheikh, Stephen Shore, Rosalind Fox Solomon, Thomas Struth, Jeff Wall, and Nick Waplington. As well as a collaboration among four academic museums: Picker Art Gallery at Colgate University, the Wellin Museum of Art at Hamilton College, the University of Albany Art Museum, and our Tang Teaching Museum at Skidmore. Between 2009 and 2012, each of the twelve photographers in This Place spent an extended period of time in Israel and the West Bank, where Muslims and Jews, Palestinians and Isrealis, Africans, Bedouins, and others live side by side. Always aware of the threat of violence upon them, the photographers still produced wide-ranging work. Whether rendered as large format color, black and white, or documentary photographs that span pictorial genres of landscape, architecture, and portraiture, the images in this exhibit show the complexities of the region and the expansiveness of photography itself. This Place gives an inside look into a life that others may never get to see due to how contested the region is. The amazing photography not only reveals breath taking landscapes, but also conveys stories in each of the photographs, providing a deeper understanding of how the region impacts those who live there. This exhibit allows an in-depth look into the lives of its residents, which makes this exhibit as equally powerful as it is sentimental. Wendy Ewald, photographer for the following sets of photos, has employed participatory photography to engage and educate children and adults around the world, ranging from rural Appalachia to a small village in India, and even from Labrador, Canada to a village in the Colombian Andes. Instead of photographing her subjects, Ewald invites them to photograph themselves and their lives -- teaching the participants to empower themselves through photography. For this exhibit, Ewald collaborated with fourteen different communities to produce a collective portrait of life in Israel and the West Bank. The pictures in each set capture the unique character of each community and allow us to see the world through their eyes. 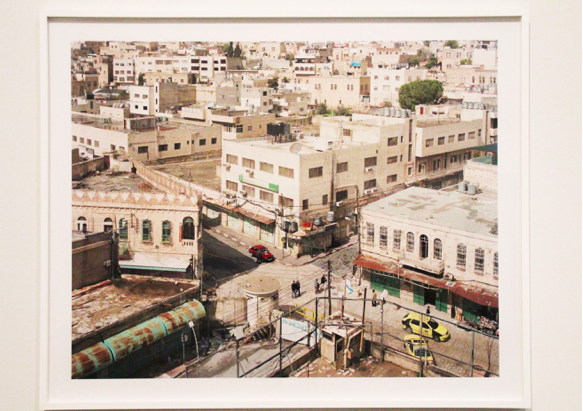 Wendy Ewald, Office of Social Affairs, East Jerusalem, 2013; Digital Prints on aluminum. Photographs by children from the Burj Laq Laq, Old City: Aseel, Achmad, Bayan, Hiba, Huda, Israa, Jabar, Jibreen, Monzer, Narmeen, Mohammad, Nasser, Nita, Razan, Sohail. Julis Comprehensive School, Village of Julis, 2013; Digital prints mounted on aluminum. Photographs by 7th and 8th grade students: Ameer A., Ameer I., Areen, Arwa, Hiba H., Hiba N., Ilan., Laura, Nada, Nasmat, Razeen, Tamar, Wassim. Blink Social Media Agency, 2013; Digital prints mounted on aluminum. Photographs by employees: Anat, Danny, Dor, Einav, Etti, Guy, Hagar, Lior. Samoud Challenge Center, H2, Hebron, West Bank, 2013; Digital prints mounted on aluminum. Photographs by children affected by nearby settlements: Adib, Ahed, Ahmed, Aseel, Hassan, Ibrahim, Mohammed, Saja, Salsabeel, Sharif, Shoroq, Samar, Waleed, Yazan. Tzahali Military Academy, near Ashkelon, 2013; Digital prints mounted on aluminum. Photographs by military academy students: Adi, Doria, Hadar, Hannah, Neta, Shira. 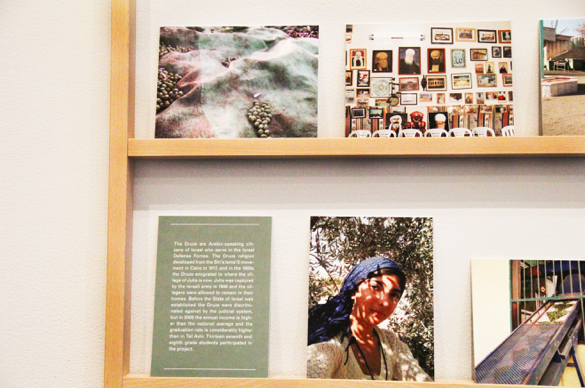 Education Institute, Sapir, Lod (Al- Lydda), 2013; Digital prints mounted on aluminum. Photographs by children from the Burj Laq Laq, Old City: Aseel, Achmad, Bayan, Hiba, Huda, Israa, Jabar, Jibreen, Monzer, Narmeen, Mohammad, Nasser, Nita, Razan, Sohaila. Stephen Shore incorporated the use of color photography as an art form in the 1970s with his photographs of ordinary America. His approach to photographing Israel and the West Bank, a region he called “impossible to comprehend,” was to employ a variety of techniques to capture its troubled, complex beauty. The works seen below are mainly landscapes and cityscapes, shot in color with a large-format camera -- though Shore also worked with a handheld digital camera and created black-and-white photographs of ancient cites with a view camera. Shore’s photographs are highly observant in execution. They invite us to slow our gaze and consider the ways in which the history of these beautiful places is presented into the fiber of the region. Nick Waplington, whose first major work was a study of working-class families in a U.K. public housing project, has a long interest in family. While living in Israel from 2008 until 2010, he photographed more than two hundred Jewish settlements in the hills of the West Bank, combining family portraits with images of the natural and built environment. Waplington was particularly fascinated with the problems and contradictions of the settler movement among immigrant families. His photographs are shot with a historical 8x10 inch bellows camera, which he used to distinguish his work from photojournalism -- the predominant mode of photographic representation of the West Bank and the settlers. Gilles Peress documents the impact of the Israeli-Palestinian conflict on everyday human lives in his photographs of Israel and the West Bank. He uses photography as a means of understanding reality that goes beyond the media’s calculated presentation of social and political situations. 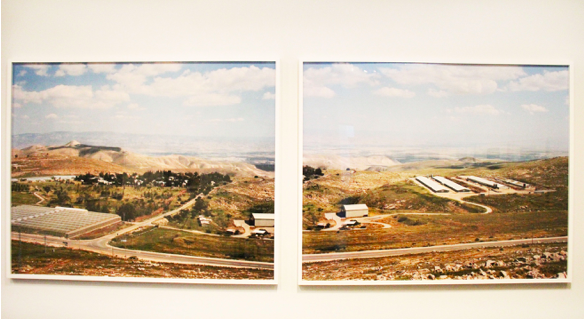 The images exhibited in a panorama below represent the most recent chapter of Peress’ engagement with Israel and Palestine, a project he began more than twenty years ago. With his imposing grid installation, akin to the layout of a photographic contact sheet, Peress invites us to contemplate how the troubles of this region are embedded and repeated within every second of unfolding time.